shouldn’t the bigger story be the 30% of the households in this country who do not earn enough money (or do not earn enough to support two children) to pay federal income taxes, and how can we fix that? or the fact that the bottom 40% of the population owns only 0.2% of the total wealth in the nation? or the fact that the top 1% holds a third of the total wealth and the top 10% holds 75% of the total wealth. or the fact that the greatest period of economic growth (1940-1980) correlated with the least income inequality and the most progressive tax rate (too high in my mind, but it worked, didnt it?) and how the middle-class stagnation and greatest increase in inequality since 1928 (from 1980-present) is also correlated with the lowest tax rates since 1932? 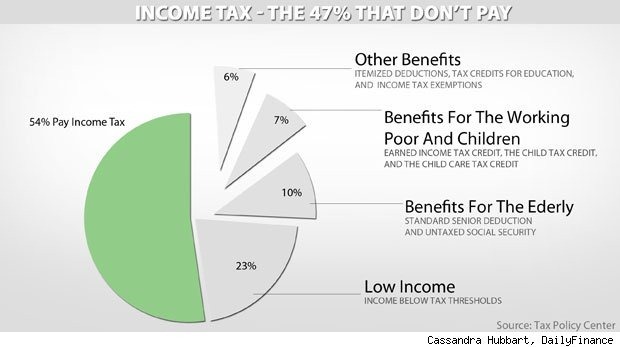 after seeing the arithmetic, does it now seem unfair that the 46% of the population do not pay federal income taxes? no one likes moochers and no one likes lazy people. but most people receiving benefits are not George Costanza.